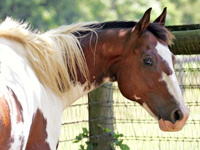 Jackson arrived at Mylestone in summer, 2012, a blind paint gelding. He is now about 13 years old (2015). 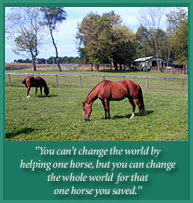 He was part of a large cruelty case in which many of the horses were starved. Jackson only needed to gain about 75 - 100 pounds. He is now up to full weight and looks perfect. His blindness comes from a case of uveitis in his left eye which was never treated and a large cataract in his right eye. He had chronic flare ups with the uveitis and required daily medication. In March 2013 his left eye was removed because it had become painful. He may see some light from his remaining eye, but is one of the most well-adjusted blind horses we have had at Mylestone. 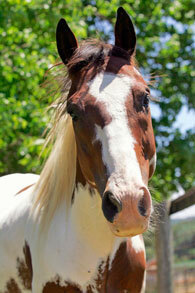 Jackson has a very sweet disposition, loves to be brushed, and comes cantering to you when you call him. We hope to use him in our program for the special needs students that come to the farm. This sweet fella would love to know you care. Can you sponsor Jackson? Perhaps you could make a donation to his care. Thanks so much.